It was the first time we had done one for a while, but it went very well so we are certainly going to do some more (Guided walks that is). On a damp Saturday October 29th a group of close to 30 walkers fronted up for the first Friends of Tarra Bulga walking activity for many years. The Boondarra walking group coincidentally had a posse of walkers planning to do the same walk that day so they were invited to join us which was one contributor to the healthy numbers. It was apparent early on that the moist conditions were very suitable for small hitchhikers so regular stops were made as seen it the picture below, to stop and search and turf off any castaways. We organised a car shuffle and the walk started from the Tarra Bulga Visitors Centre. One of the first sections you encounter is through a pine plantation which is a bit dull, but that soon gives way to some impressive forest. One early feature of the walk was the occurrence of several rare Burrowing Crayfish. 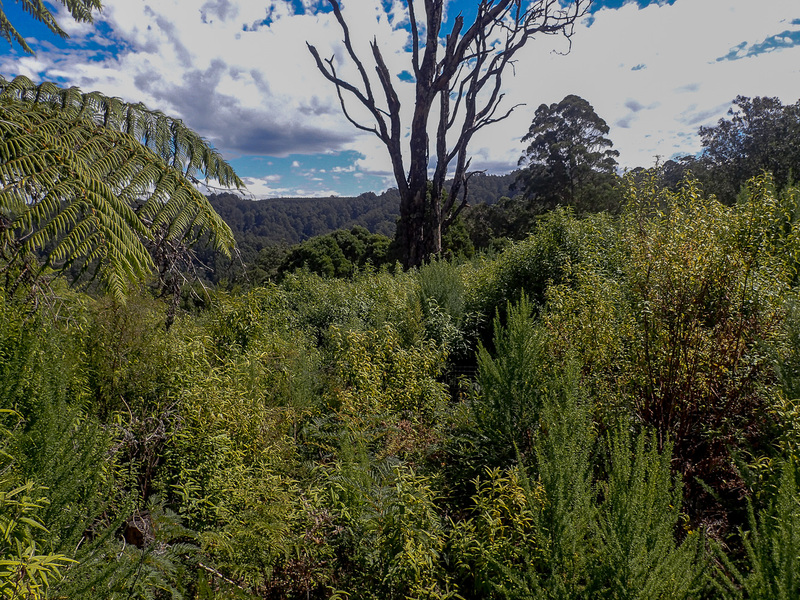 As we got further into the walk towards the Tarra Valley section the large tree ferns became a feature with many epiphytic plants on their trunks as well as a range of impressive fungi species and the massive trees that are a feature of the park. The recent rainfall meant that gullies were flowing with water and it was a great opportunity to see some waterfalls cascading next to the track.